During the fall, our grunt sculpins lay their eggs in empty giant barnacles. They care for them throughout the fall and into the winter. This year, the first eggs hatched in early December and the eggs continued to hatch until the end of April. Some days, either no eggs would hatch or just a few would, but occasionally we had almost 200 hatch in one day! In total we had 1,092 grunt sculpin babies hatch!! Since we were not able to successfully raise the baby grunt sculpins last year, we released them off our floating dock and hope they found shelter in the nearby eelgrass bed. 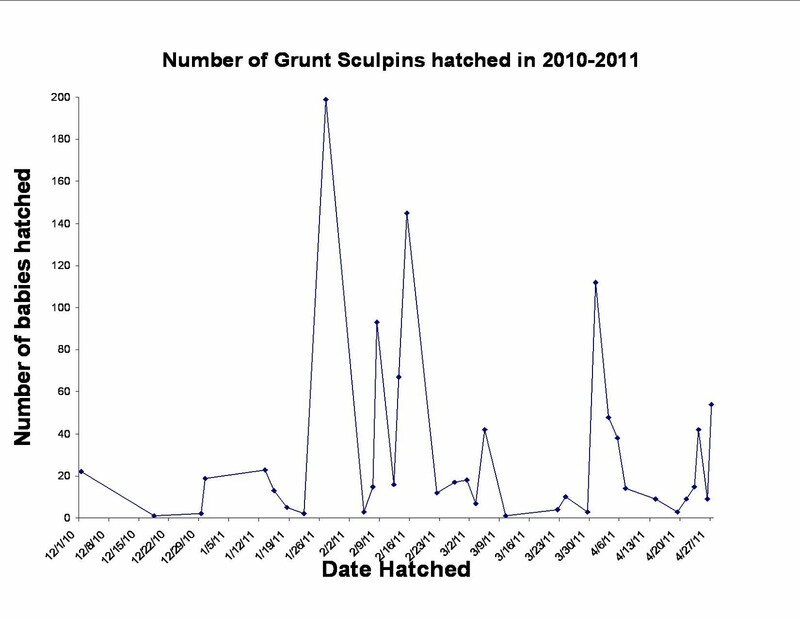 This graph shows how many grunt sculpin babies hatched from December to the end of April. You can see there is no pattern. 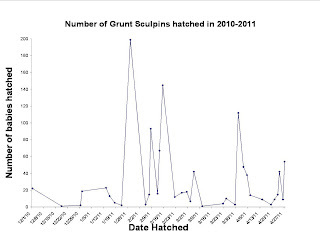 You can compare this year's graph to last years here: Baby Grunt Sculpins 2009-2010. Be careful, the two graphs have a different scale; for the "Number of babies hatched", it goes up to 200, last year's graph only goes up to 100. Although the grunt sculpin babies no longer grace our tanks, we still have a lot of other baby (and adult) animals to see. And starting June 10th, we will be open Wednesday-Monday, 11am-5pm. "Catch a falling star and put it in your pocket"